(Editor's Notes: The poster calls this "amazing footage." I don't know about that, but it is very interesting. 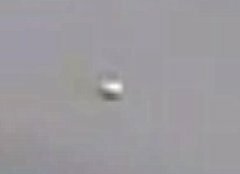 The daylight footage shows what mostly appears as an oval-shaped object. At first it is seen in the skies as it slowly descends and lands or crashes behind a mountain. We had to work with the video quite a bit to enhance and stabilize it. Because it was so shaky, even the editing process only helped to a point.